The Washington Park neighborhood is located west of Polo Club, Bonnie Brae and Cory-Merrill, south of Country Club and north of Platt Park. Washington Park is southeast of the city center in an area identified as Denver South East. 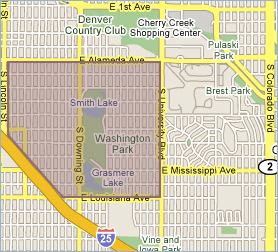 Southeast of downtown Denver, the Washington Park neighborhood is bordered north-south by Alameda and Louisiana Avenue, and east-west by Washington Avenue and University Boulevard. Surrounding its namesake park, Washington Park homes are less eclectic than other city neighborhoods and consists largely of quaint bungalows and steep-roofed Tudors, made from brick and stucco. Although not as visibly predominate, other architectural styles range from mission to classic ranch to Dutch colonial. The park is bordered by a “mansion row”, where examples of all these styles are showcased on a grand scale. Aesthetically, the Wash Park real estate feels secluded and private due to deep bungalow porches and a canopy of mature trees. The best location in Wash Park!